Who doesn’t love a winning statement coat? If you’re looking for a brilliant place to scoop up your own at a fraction of the price of retail consider shopping thrift or consignment. The environment and your pocketbook will thank you. Here are some of the fantastic statement coats I’ve thrifted in the past few months, some of which I’ll be keeping and some of which I’ve listed in my Etsy store. This coat below needs no introduction since I stalked it at Anthropologie for over a year. The thrifting Gods were smiling on me that day at Talize when I spotted this in the racks. The fact that it fit me was a huge bonus. 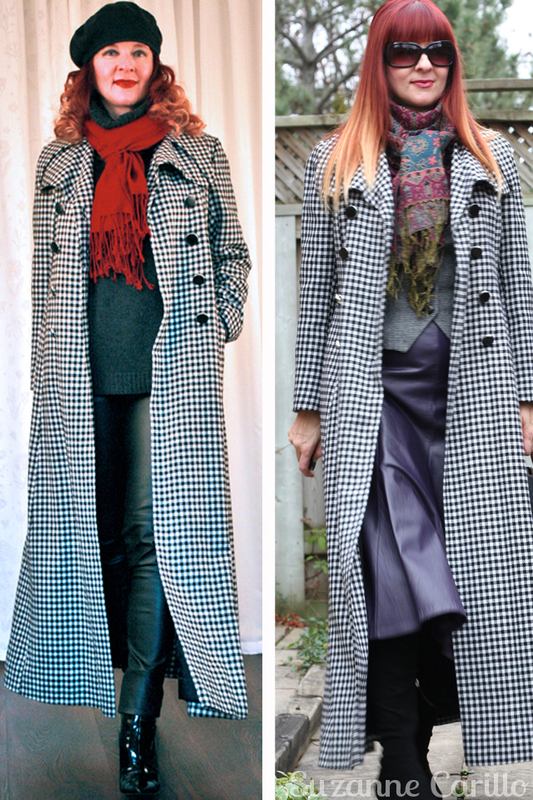 I already own a black and white gingham maxi coat for winter which I love. But that didn’t stop me from purchasing this lighter shorter version. Something about gingham makes me feel wonderfully French. After thrifting this khaki jacket below I knew it was the perfect canvas to iron on some quirky patches and make it a one-of-a-kind piece. This vintage tapestry parka is older than me, possibly much older. I had to stitch up some inner seams on one sleeve but otherwise it is in mint shape. I spotted it just as it was going out onto the thrift store floor. SCORE!!! I’ve been wearing this often this winter. It is casual and comfy but has some panache. I wore it with my skirt and boots too. I really loved this poncho below because it has arm holes so it is a cross between a poncho and a sweater. I haven’t been getting much wear out of it though so I wouldn’t be surprised to see this pop up in the Etsy store soon. Leather trench coats are a weakness of mine. This caramel one is one of the latest additions to my collection. 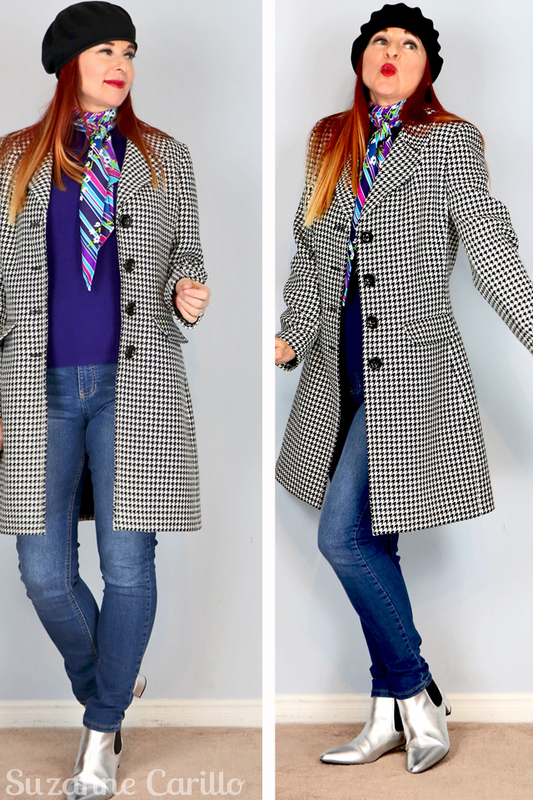 I adore this multicoloured plaid wool statement coat. Don’t the red boots pop? They have sold but the coat is still available. This is another beautiful light spring/summer statement coat that has since sold. 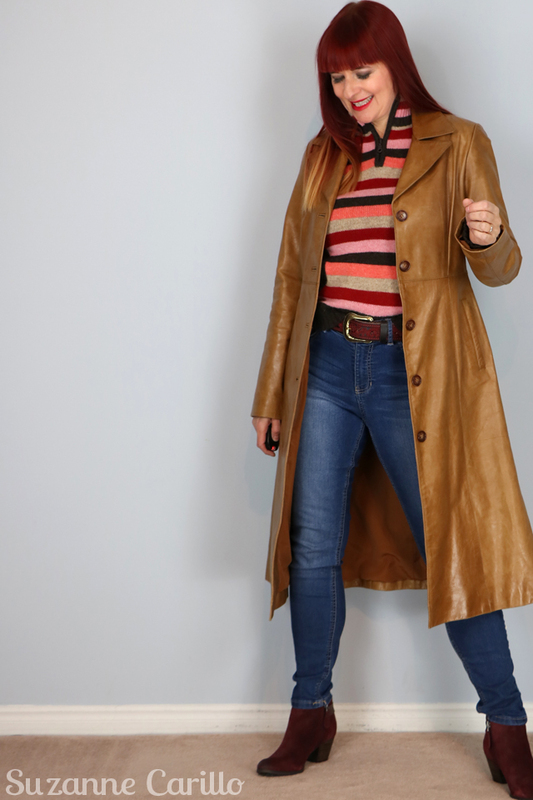 I already own a classic jean trench coat which I wear often so I didn’t feel the need to keep this one which has also sold. This pink London Fog trench coat is currently for sale. 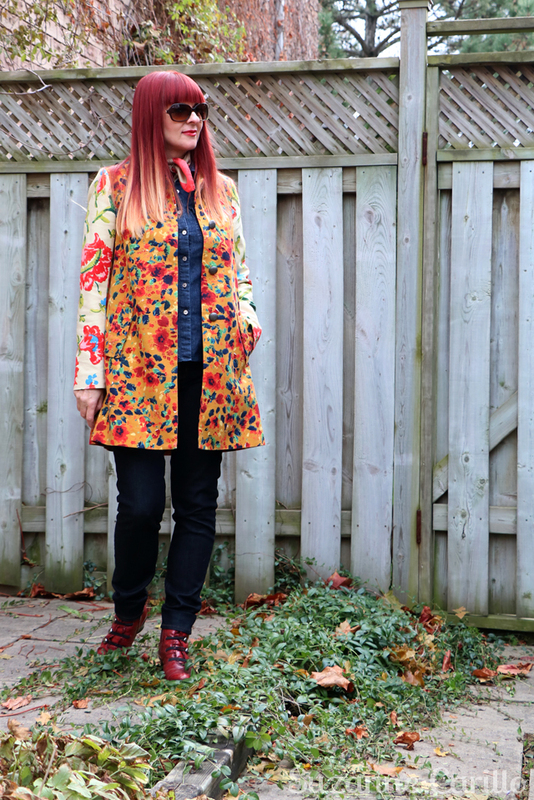 Bright coats are such a nice surprise on a grey day. This is of course only a glimpse of the many coats I’ve thrifted. I’ve since added quite a few more both to my Etsy shop (and still have more to list) and to my personal collection. Do you own a winning statement coat? Fall coats from my Etsy store and collection. How to choose a long winter coat. Winter statement coats and vinyl raincoat. You might also like to pop by and visit Elle, a bloggy friend of mine that also posted today about her incredible collection of statement coats. 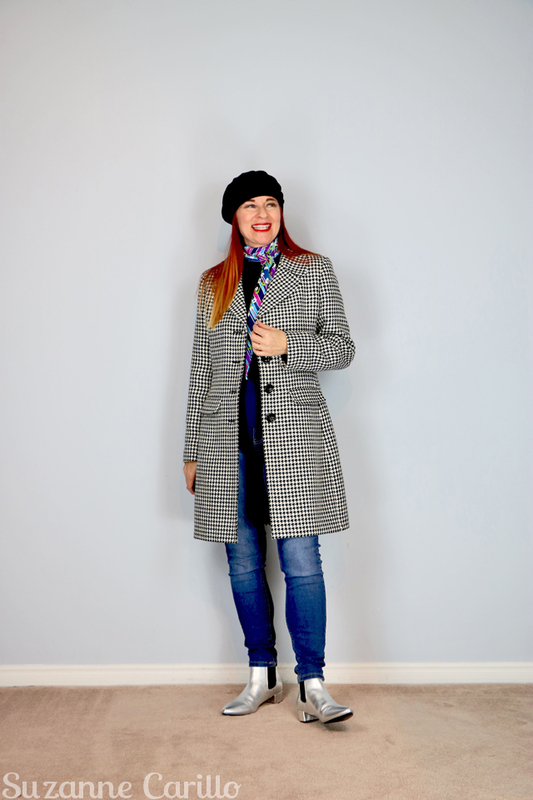 Linking up with the lovely Judith over at Hat Attack. « When Patterns Don’t Flatter – Which Dress Did I Keep? Coats are a bit of a weakness of mine and all these that you shared here just trigger all kinds of happy neurons. This is one of the reasons I prefer fall/winter/spring to summer. I can’t wear coats in the summer! Pardon me now while I go visit my sweet darling coats hanging in my closet. They’re feeling neglected, I’m sure. Well you chose the perfect climate in Seattle to wear jackets. It really is the ideal temperature for chic layering. Your coat game is strong. Very strong. Yah…that Anthro coat is fantastic! Well done you! I’ve got a few coat sewing plans in the works right now. This coat makes me think a tiny bit about your fabulous polkadot coat. Also makes me think of my orange print coat with the blue buttons. Oh my gosh, we are on the very same page. I love your statement coats and I love them even more since you got them at the thrift stores. I, also, have gotten wonderful coats secondhand. Either that or from children stores where the prices are so much more reasonable. I especially love your gingham checked coat and your tapestry coat. They are all sensational. So many gorgeous coats! I covet them all, particularly the plaid and khaki. I think that Winter is long enough to enjoy a lot of different coats, so I never let an opportunity to buy a bargain coat pass me by!. Now I’m waiting for the big clearance in my fav outlets and secondhand shops! It’s funny I didn’t think I would wear that one so much but it has turned out to be one of my favourites. Fabulous coats! You look lovely in all of them. You’ve made me realise that I own quite a few coats and seem to have a weakness for them as I’m always buying them – 16 over the past three or so years. All thrifted bar one! So many fun and fabulous coats. I’ve been searching around here for coats to wear when I venture back up north. I definitely have a coat shortage due to living in Florida all these years. Unfortunately the thrift and consignment stores in my town are seriously lacking in groovy vintage coat selections. Not surprising I guess. But I’d love to find a checkered or plaid coat like the ones in your photos. I’m bummed your plaid one is too small for me. The search is on! 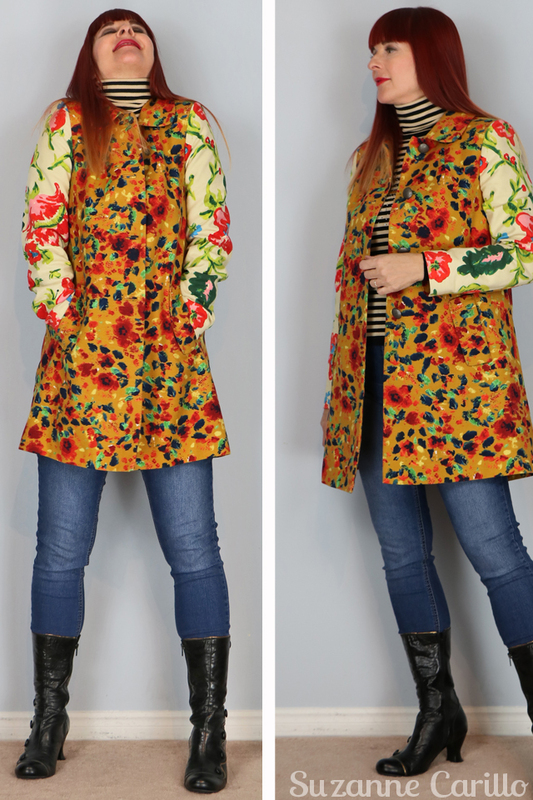 So many beautiful coats, so little time to wear them all!! I’m always amazed that there are so many great leather and suede coats at the thrift store. Growing up it was difficult to afford such a splurge. Leather was considered high end luxury. It might be the reason you and I are both still drawn to them. We see the quality others don’t recognize. You know I have a bit of a coat addiction myself, and can’t resist bringing home yet another fabulous outerwear find from the thrift store if I don’t have one like it at home. We do spend 8 months of the year wearing coats or jackets, so I think you need to have one for every outfit/weather possibility. I love that vintage tapestry jacket. The colours were made for you! I snapped that one up so quickly from the rack when the woman was putting them out on the floor! Haha! I love so many of these coats. You really have an eye for them. If I lived nextdoor, you could thriftshop for me. I bet I would buy 90% of what you would bring home. In my size that is. Not in that teeny weeny size of yours. My size has gone up since I last visited you. Even my feet are getting bigger! What is that about? 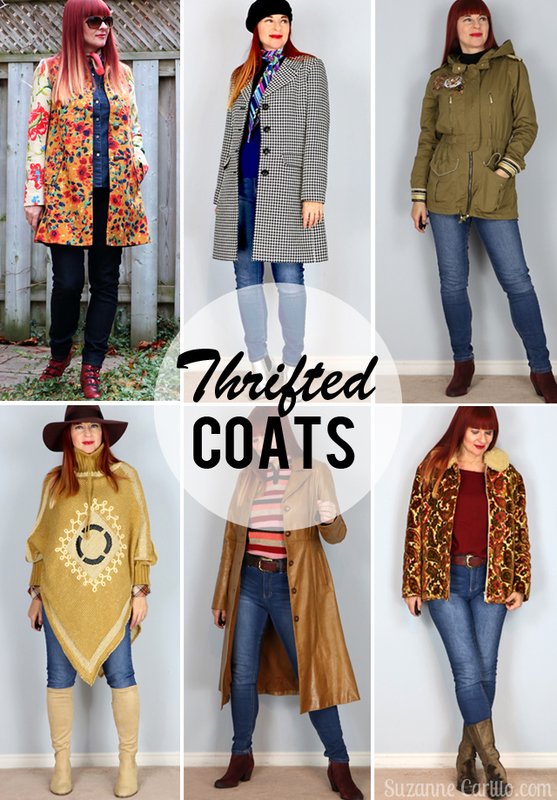 Almost all of the coats I own have been thrifted or secondhand- it’s true that you can often find really good coats secondhand. 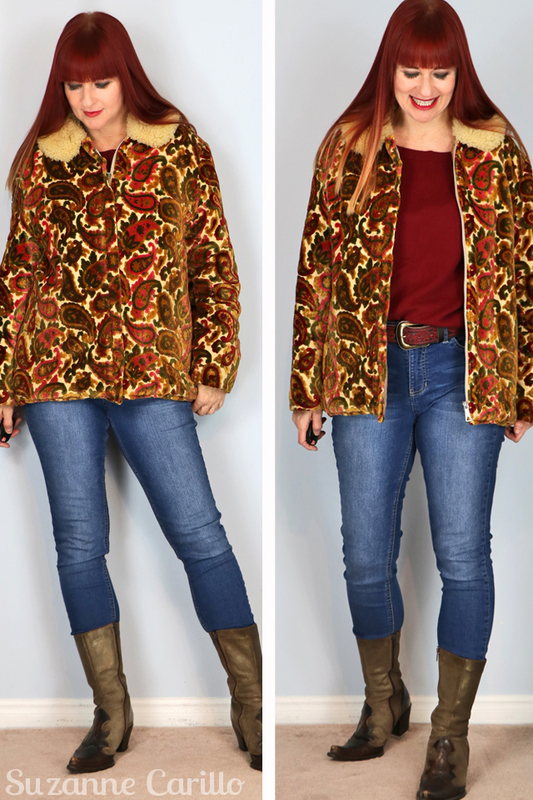 Even if it can sometimes be hard to find other pieces, coats seem to abound! Statement coats are such glorious pieces, and you have so many beautiful ones. I do not see ponchos as often as I used to, with your richly colored hat I can imagine you riding horseback in a western vista. Thank you for sharing with Hat Attack!